When the skin is no longer as efficient in eliminating fat, excess fat becomes stored at the hips, thighs and bottom. Result: the skin becomes dimpled, loses its elasticity and cellulite appears. The L'Oréal laboratories have created new Perfectslim, with active "Lipo-reducers" and Par-Elastyl?, to visibly reduce the appearance of cellulite and firm the skin. 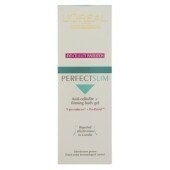 Perfectslim contains "Lipo-reducers", a powerful ingredient to transform fatty acids into energy*. A value product that produced some visible results. Value product. Reduced celulite. Lifting effect. Coats the surface of the skin. This product did reduce the visibility of celulite on thighs and made the surface smoother to the after daily use. It doesn't completely sink into the skin and tightens the surface to 'lift' the skin. This product is interchangeable with the 'night' version. They are much the same. "A value product that produced some visible results. "